A new structure for the development of the capital will be set up as part of the future government, governing PSD sources told HotNews.ro. According to them, a department for the development of Bucharest will be set up within the Ministry of Development, at the proposal of the Bucharest mayor Gabriela Firea (PSD). She confirmed for HotNews.ro that she proposed the establishment of a new structure of a Bucharest State Secretariat, based on the model of England, where the London Ministry exists. ​Eight people have been shot at and two died in the area of Bucharest downtown known as Perla on Monday, according to judiciary and media reports. According to judiciary sources, the aggressor is a member of the Police. The two people who were shot dead were both women - one of which sources alleged was the target of the aggressor. Papa Roach’s gig that was supposed to be held in Bucharest in Constitution Square on July 2 was cancelled, organizers inform. They announced that the gig in Romania was cancelled due to some logistical problems the production team had. Streets filled up with garbage, garbage blocks on main roads, lack of hot running water, lack of sewages – this is how Bucharest looks like according to VerticalNews.com quoted by Tourism-review.com. Bucharest was voted the ugliest EU city capital. Romanians mark 21 years since the bloodiest miners’ outbreak on June 13-15 in Bucharest. Over 1,000 people were hurt and hundreds arrested following the events in June 1990, marked by a violent clash between miners and protesters in University Square. The official death toll was six but associations of miners’ victims claim that the number was higher. About 70 galleries and alternative spaces in Bucharest and Cluj, central Romania will be part on Friday on June 10 at the fifth edition of Galleries Night, a press release remitted to HotNews.ro informs. Several house searchers are conducted on Thursday morning in Bucharest targeting cigarettes smugglers, news agency Realitatea TV reads. Ten persons were taken for hearings. US Embassy to Bucharest will be closed on May 30 to mark the Memorial Day, dedicated to American soldiers who were killed in battle for their country, the diplomatic mission of the United States in Romania informs. Bucharest’s general council decided on Monday that the referendum on the law of the capital city should be organized on June 26. Moreover, the seven initial questions were replaced by two questions. The government approved on Wednesday a decision interdicting the installation of overground urban networks on the public domain including telecommunications, water, energy, thermal networks. After its last gig in Bucharest in 2007, Alice Cooper returns in Romania this summer, organizers inform quoted by Metalhead.ro. The artist will perform on June 14, part of the No More Mister Nice Guy: The Original Evil Returns tour. Romania’s Culture ministry will start procedures to sign up the works of Romanian sculptor Constantin Brancusi from Targu Jiu, that comprise the Endless Column, the Table of Silence, the Kiss Gate, in the UNESCO World Patrimony. Yahoo! Organizes at Bucharest, on May 14 and 15 one of the most important events in its portfolio, Open Hack Day, where hundreds of programmers from across the world are expected. Yahoo! Uses the hacker word in the presentation of the event to describe enthusiastic programmers that come with fresh ideas meant to improve things not destroy them. Traffic will be restricted in Bucharest between May 4 to 8 nearby Constitutiei Square and further restrictions will also be imposed during the weekend on Libertatii Boulevard and Unirii Boulevard, downtown Bucharest, organizers of the Shakira concert inform. Romania’s National Citizenship Authority announced that 529 people will swear allegiance to Romania on Thursday, April 28. According to the law, Romanian citizenship is offered when future citizens swear allegiance to Romania, when they are handed in their Romanian citizenship. A judicial counselor of the Bucharest City Hall and a referee were sentenced to four years of prison and five years of prison by the Bucharest Court, Romania’s news agency Mediafax reports. Bucharest Court sentenced Gabi Paraschiv, referee at the City Hall to traffic of influence. Amy Winehouse will perform in Bucharest, on August 15 on the Iolanda Balas Soter stadium. Fans have access to the first 1000 tickets that will be sold at a 20% discount rate. British artist Amy Winehouse is known for her jazz/soul combination that characterizes her music. Bucharest Mayor Sorin Oprescu declared that the famous U2 band will not perform this year in September, Romanian news agency Mediafax reads. The Irish band will not be able to transport the famous The Claw stage in time. Intel currently has 30 employees at its research center opened in 2010 in Bucharest and the objective is to reach100 employees by the end of the year, Intel representatives said for HotNews.ro at the event presenting the second generation of Intel Core processors. 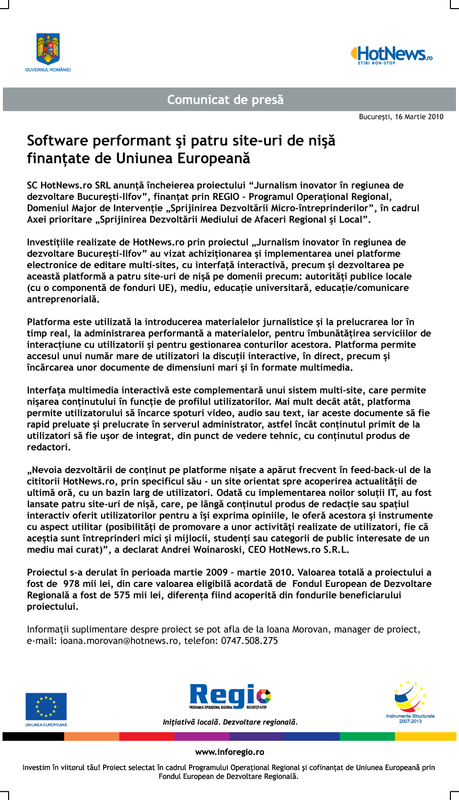 The company says the Nokia Microsoft partnership does not influence the company’s development plans in Romania.